First, congratulations, La Crosse County Democratic Party, for passing a resolution in support of single payer healthcare for all! For the first time, leading digital outlets will come together to do what cable channels and network news will not – engage in an in-depth conversation about one of the issues that matter most to Americans, their health care. 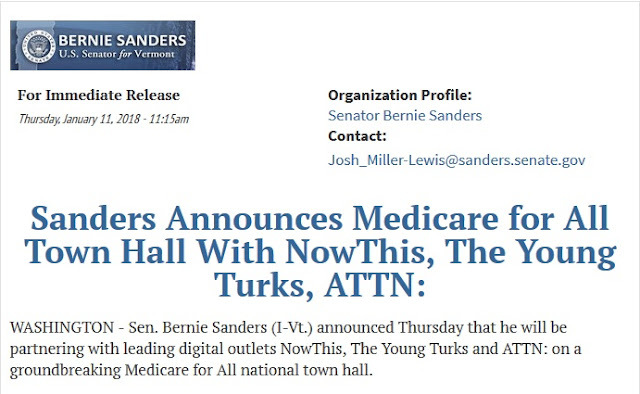 The event will be streamed live across Sanders', NowThis', ATTN:'s and The Young Turks' social media channels. Sanders and leading health care experts will take questions about Medicare for all from people around the country, discuss what it means to practice medicine in America when patients cannot afford the health care they need, talk about the economic and business impact of single payer and hear international perspectives on how universal health care can be achieved.